Midlands Logistics Park is now home to global and transnational businesses. Midlands Logistics Park’s outstanding strategic location, very competitive rents and excellent available labour pool has secured Eddie Stobart and B/S/H Home Appliances. The opportunity still exists to have a state-of-the-art warehouse built to suit your exact needs at this outstanding scheme. 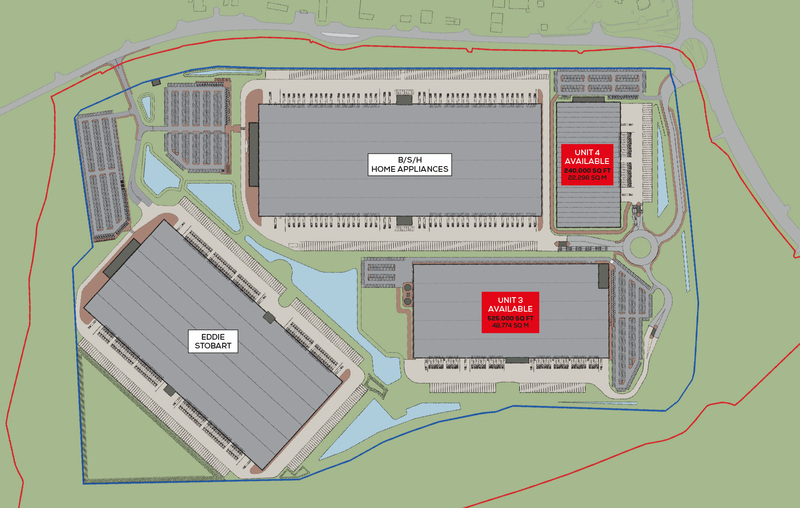 Available plots can support a further 735,000 sq ft of logistics space. Designed to achieve BREEAM Very Good, the buildings at Midlands Logistics Park are constructed to an exceptionally high quality in line with occupiers specific requirements. This is one of the few options in the region to take advantage of a possible eaves height of up to 30m. 18m to the underside of the haunch anywhere on the site (with bespoke design options of 25m and higher) offer building volumes that can meet a variety of occupier needs. Reinforced concrete dock walls with dock height of 1200mm / 1300mm to suit. Enhanced cladding and curtain walling to improve natural lighting, with Brise Soleil where appropriate to reduce solar gain.